15-LED Hurricane/Emergency Lantern | BUDK.com - Knives & Swords At The Lowest Prices! 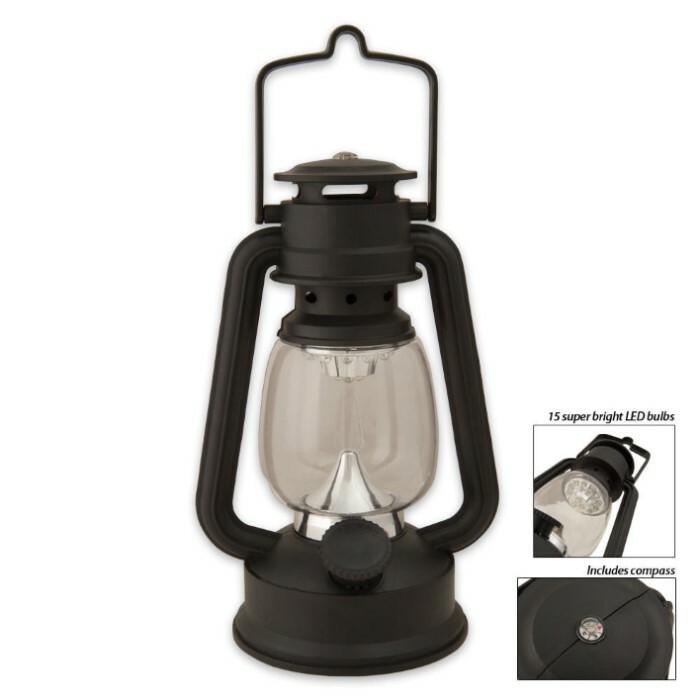 This 15-LED hurricane lantern is perfect for camping or natural disasters. It offers 15 super-bright white LED bulbs with a brightness of 15,000 MCD. 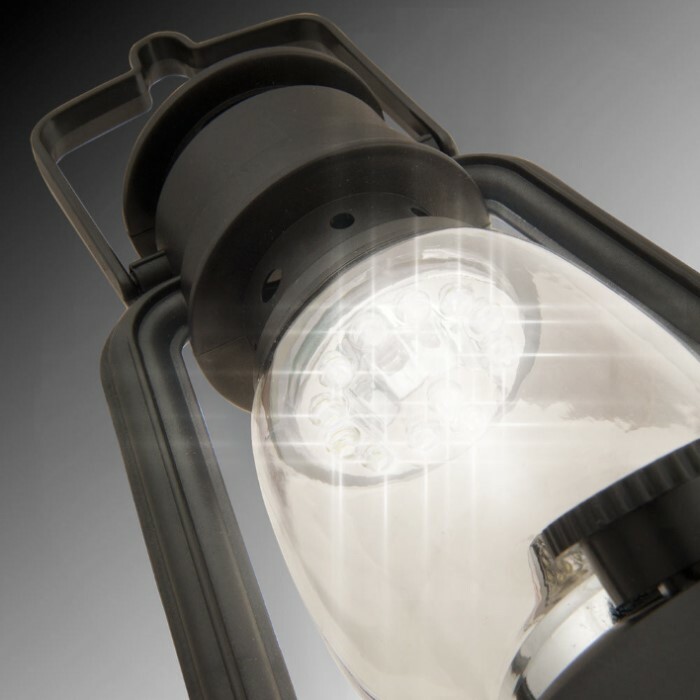 The lantern is constructed of impact resistant ABS and offers a dimmer switch to adjust brightness and save battery life. A hooked handle is convenient for hanging or carrying while hiking at night. A 3/8" compass is attached to the compass lid. Great light for the price. Bought for power outage emergency and for that it's good. Put a piece of time foil on one side for reflector and increase light power easily. This is a nice light for the price. I have used it on multiple campouts. only problem I have had is the handle broke off so I used some paracord to hang it and the problem was solved. only thing I found wrong with is that it takes 3 AA batteries not AAAs. other than that it's an amazing little lantern for the price. very bright but a bit too fragile for rough use. I will be purchasing a few more to keep around the house for when the power goes out. the dimmer switch is a great feature too. the compass will give you a general sense of direction but I would not rely on it as your only one. all and all I was very impressed with this product. great light for the money works well. Very useful for camping, my only disappointment with this product is that it's plastic, it feels very fragile, I like that it has a dimmer, it can conserve energy, it gets pretty bright, but not that bright, I haven't tested how long it lasts on full brightness until the batteries die out, it also could have had a reflective surface on one side, you don't always want that light everywhere, especially in your eyes...it's good to have on you, but I think it could be better, even for this price! Good for when "You Know Who" destroys the coal industry and finally turns off the lights. Time to : .. "Prepare or Die"! OK, first off, price is right. Next, itâ€™s small which means you can keep it around where youâ€™ll need it while not using it. The larger lamps take up too much room. Biggest advantage, AA batteries. Everyone has them and there are lots of low cost rechargeable batteries around. And it has a compassâ€¦ Sorry, that partâ€™s useless. Unless you are lost and this is all you haveâ€¦. Storms seem to knock out the power in my house just about every year. When these arrived I tested them out and was more than impressed on how much light they put out. They are perfect for a dark situation and i'll be buying a few more very soon!